With a portable double cot from Outsunny, you’ll always have a comfortable place to rest while on the go. This lightweight cot has enough room for two people, so that you and a friend can go camping without having to sleep on the cold, hard ground. The steel frame and durable Oxford fabric can hold up to 300 pounds while the elevated design allows for proper airflow. It’s foldable for easy storage and even comes with a portable carrying bag, making it your best possible camping partner! ✔ TWO-PERSON SUPPORT: A weight-capacity of 440lbs makes it possible for two people to rest and sleep comfortably throughout the night. ✔ ELEVATED AIRFLOW: An elevated, cot-style design lifts the user more than 15 inches off of the ground which allows air to flow freely on all sides and underneath. ✔ DURABLE FABRIC: The bed's durable 600D PVC oxford fabric is designed to be mildew-free, resist fading and be tear-resistant. 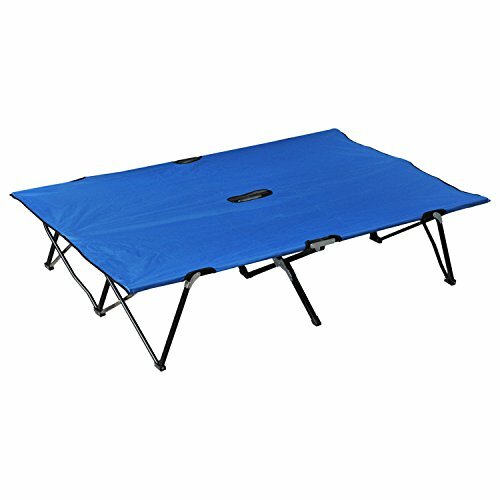 ✔ STURDY FRAME: The durable fabric is held tightly in place by a lightweight yet strong powder-coated steel frame with stable feet that ensure safe and level placement that won't tip over. ✔ PORTABLE DESIGN: With a lightweight, portable folding design and included travel bag for simple storage, it's easy to take our cot with you anywhere you go. If you have any questions about this product by Outsunny, contact us by completing and submitting the form below. If you are looking for a specif part number, please include it with your message.